This plugin gives the a player the ability to heal another living creature or player with a bandage if damaged. It will remove the bandage item from the player and apply to the player/creature a certain amount of health. I am adding new functionality and more server administration control with permissions and configuration files. This is my first open-source project and I am very open to ideas/comments to help improve this project. As of version 0.46 I am looking to put this into a release as I catch up on the last few 1.1 revisions and developing some more in depth functions with 1.2 release for craftbukkit. Ability to heal another living creature/player using a bandage. Check a player/creatures health with a command. Adding permissions compatibility for users/groups. Configurable delay between bandage usages. /bandageme : Description of plugin's features. 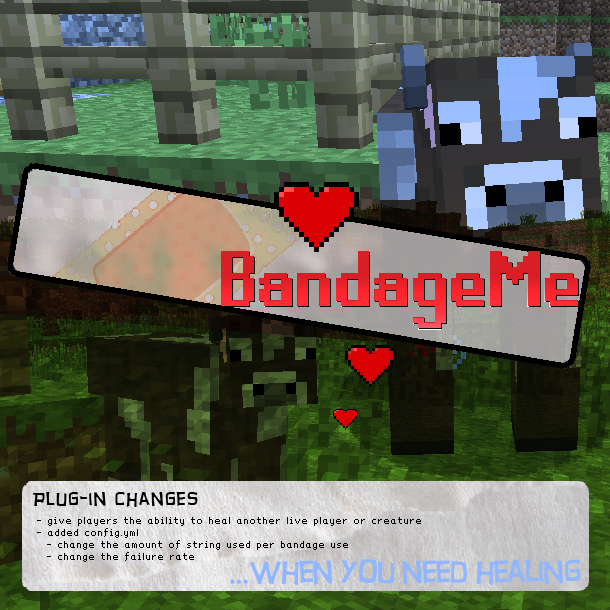 /bandageme <player> : Check the player's health and warns the player you are checking. Have at least 4 string in your hand. Stand near the creature/player that you want to bandage. Sneak and Right-Click on creature/player with string in hand. The string will be removed if the bandage is applied to the creature/player. 1. Remove the msg crap Begining healing (name) 2. Add a line in the config.yml so we can config how many hearts it should regen ! 3. Remove the chance fucktion this will clean up hella lines of code. 4. make it so that is simply regens there are too many issuse with it only healing half a heart. Way too many messages keep coming up saying "You want to heal self?" I would like it if you would make it so we can configure how much someone is healed per bandage item. I would like to make 1 paper = a bandage and heal 2 hearts. Definately bookmarking this, sounds promising. One thing that would be nice if you could see health of another player in the ui.. i think i saw a plugin for spout that could do this, but don't think it's updated..
Could it be possible to add something like sneak + left click for text annoucen of players hp? not sure what can be done this way..
Can't wait for perms so that I can finish my medic guy! Thanks man, really digging the feedback. The delay between bandage use will definitely be added soon. This plugin interests me because the old Bandages plugin is no longer compatible with WorldEdit. One thing I liked about that plugin was the delay to use bandages, making them like Minecraft's current potions and making it less easy just to spam bandages and stay alive. If that could be implemented, if would be awesome. Otherwise it's sounding quite good.